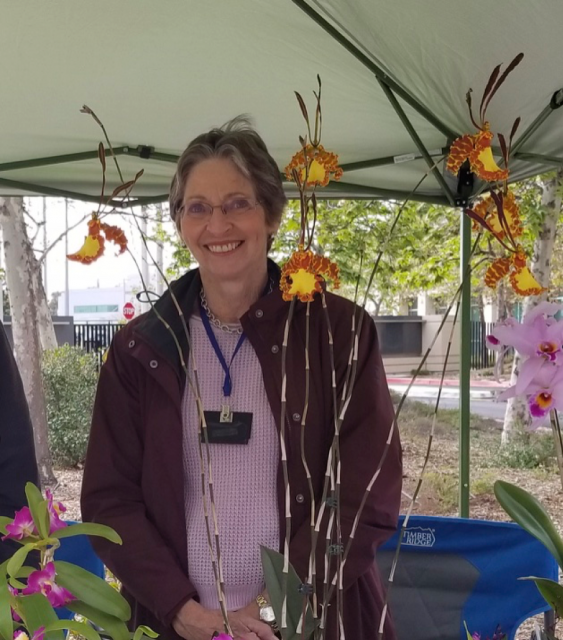 “My husband and I had our first orchid collection in 1970. We built a lean-to greenhouse over the bedroom windows of our rented Brooklyn townhouse and joined the New York Orchid Society. Those lovely people gave us our first orchids. When we left New York for the Caribbean the next year, we gave away that collection to other orchid growers. We spent the next 5 plus years in the Islands exporting tropical fish, where we once again grew orchids and enjoyed viewing them in the jungle as well. We returned to the US in 1976 and moved to Fallbrook, CA. Our first business was growing cactus and succulents and the orchid hobby had to wait. We then became involved in international trade and raising our daughter. 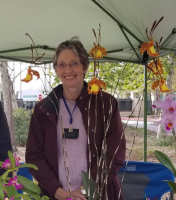 It wasn’t until we moved to Rancho Santa Fe in 2002 that we were able to seriously pursue our orchid hobby again. We built a beautiful greenhouse on our property and started collecting orchids. Unfortunately, my husband passed away in 2012, but I continue to find great pleasure and satisfaction in growing orchids.